If we apply an Information Model based on the separation of the Names (labels), Taxa (concepts), and Exemplars (strains/objects), we are able to track changes in nomenclature and taxonomic opinion separately, without losing track of the underlying organism (the Exemplar). Catherine Lyons presents the NamesforLife concept at the IDF Members Meeting. The Alteromonadales represent an interesting test case for demonstrating how one could apply Digital Object Identifiers (DOIs) to solve the problems associated with changes in nomenclature and taxonomy of a particular group. The family was effectively defined by Garrity et al. in version 1.0 of the Taxonomic Outline and independently by Ivanova and Mikhailov in 2001 and is formed on the genus Alteromonas, which serves as the type genus for the family and class. Alteromonas was initially circumscribed by Bauman et al. in 1972 and subsequently emended (although not formally in all cases) on more than 15 occasions through the addition 20 species. Nineteen of these species were subsequently moved to four other genera, two of which are also members of the Alteromonas (sensu Garrity et al.) and two genera are members of the family “Oceanospirillacea”, class “Oceanospirillales”. Some of the later proposals also yield three heterotypic synonyms, two homotypic synonyms, the subdivision of one species into two subspecies which were subsequently rejoined following a move to another genus, the subsequent subdivision of one reassigned species into five distinct species in that genus, and one orthographic correction that was required to correct an error when latinizing a species name. Thus, the original 20 species of Alteromonas have appeared under a total of 64 different names in five genera, two families and two classes. 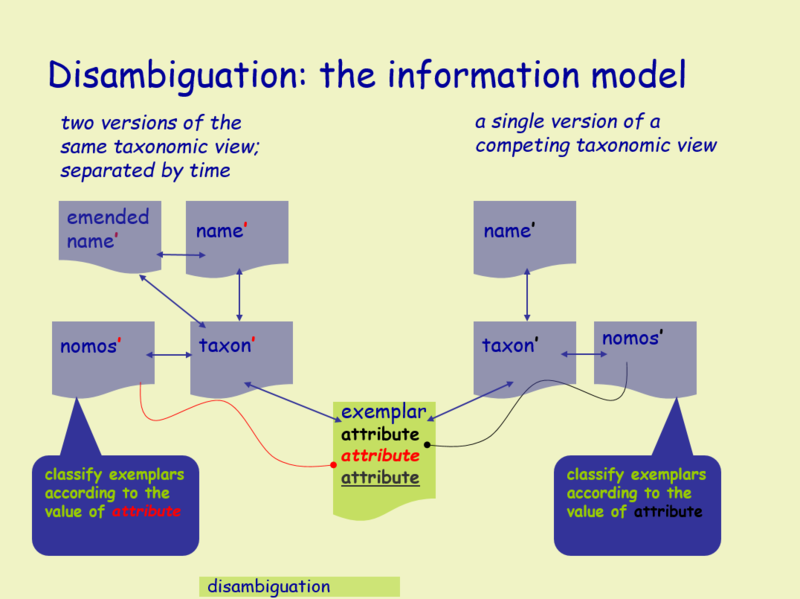 If we apply an Information Model based on the separation of the Names (labels), Taxa (concepts), and Exemplars (strains/objects), we are able to track changes in nomenclature and taxonomic opinion separately, without losing track of the underlying organism (the Exemplar). This enables a means of separating competing taxonomic views, thereby effectively disambiguating any synonymous names and competing taxonomies applied to an exemplar. Further, if we assign a DOI to each Name, Taxon, and Exemplar, we essentially create a set of Information Objects - persistent, online, public documents - which serve to instantiate nomenclatural events, taxonomic opinions, and exemplars. These Information Objects provide metadata and form a navigable graph when linked with other Information Objects and to online information outside of NamesforLife. They are easy to link to from online journals, databases, and similar resources, and are guaranteed to be persistent. To achieve a working prototype based on this Information Architecture, we plan to perform some exploratory work with publishers, biodata curators and genomics researchers to find a path toward obtaining funding for this project and developing standards for clean nomenclatural and taxonomic data. [permalink] Posted June 22, 2004.